villa seneca planter. plant stand. designer planter. plant pot. Villa Seneca Planter was inspired by furnishings of the Mediterranean region. It’s latticework is reminiscent of mild climates, breezeways, and screened verandas. 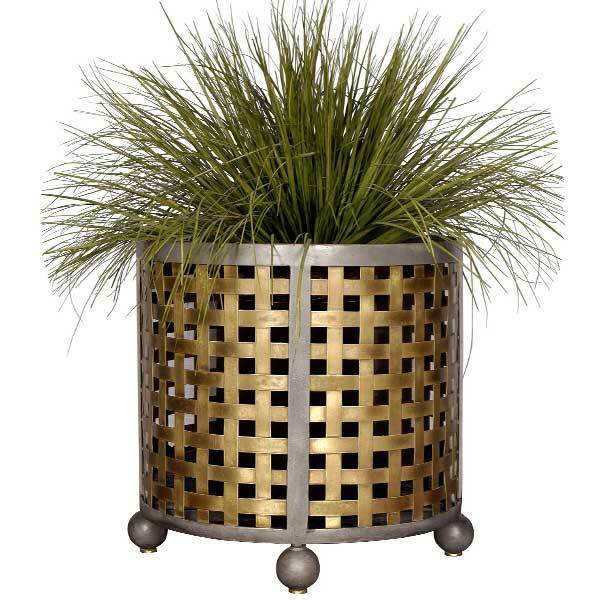 Constructed of metal, the planter is offered in multiple sizes. Its brass latticework is lightly distressed and antiqued. Four polished bronze glides are provided which also serve as levelers – a useful feature when the floor is uneven. With its understated elegance, it makes an exceptional container for a plant or a tree in upscale residential and hospitality interiors. The planter is offered in a variety of finishes. It is recommended that the planter be used with a pot and pan to catch drippings. Custom sizing is available. Designed by Shah Gilani, ASFD.